When it comes to performance air filter options, Spectre HPR air filters have you covered. Spectre air filter products are designed to increase power and torque for your engine. Spectre offers multiple styles and sizes of air filters to fit almost any configuration and vehicle. Spectre HPR air filters feature a pre-oiled, synthetic filer media that provides exceptional airflow for increased performance without sacrificing engine protection. Spectre OE replacement air filters are designed as a high flow replacement air filter that fits perfectly in your stock airbox. These air filters have been engineered for increased flow and greater performance. Find Spectre OE replacement air filters by your car or truck's year, make, model and engine. These stock replacement air filters have been engineered for increased flow and greater performance. 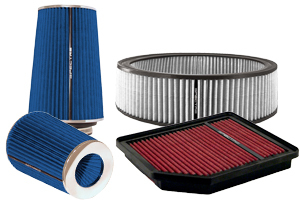 Universal air filters fit a wide range of vehicle applications. The Spectre Round Tapered (Cone) Universal Air Filters are designed with high quality materials that provide exceptional airflow. Browse our list of universal clamp-on air filters by dimension. Clamp-on a Spectre Universal Air Filter on your intake system. These universal air filters fit on a range of air intakes with flange size from 2.5 inches to 6 inches. These universal filters are made with synthetic material and come in different colors. Find clamp-on universal air filters by category. Spectre breather filters are designed to clamp directly to metal or plastic tubing, making them ideal for filtering the air going in and out of your engine’s oil, transmission and differential vents. Note: Legal in California only for racing vehicles which may never be used, registered, or licensed for use upon a highway. See spectreperformance.com for CARB status on each part for a specific vehicle. The Accucharge Precision Air Filter Oiling System is designed specifically for the cleaning and care of all Spectre HPR filters. The cleaning system comes complete with 12 fluid ounces of cleaner and 8 fluid ounces of oil.